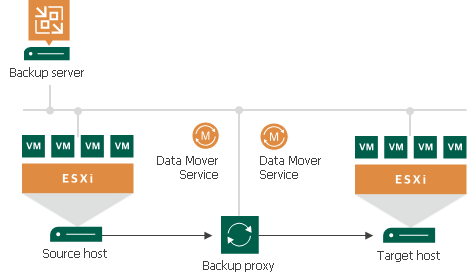 Similar to backup, Quick Migration uses two-service architecture: the source-side Veeam Data Mover interacts with the source host, and the target-side Veeam Data Mover interacts with the target host. To perform onsite migration, you can deploy one backup proxy for data processing and transfer. This backup proxy must have access to the source host and to the target host at the same time. In this scenario, the source-side Data Mover Service and the target-side Data Mover Service are started on the same backup proxy. The common requirement for offsite migration is that one Data Mover Service runs in the production site (closer to the source host and datastore), and the other Data Mover Service runs in the remote target site (closer to the target host and datastore). During backup, the Data Mover Services maintain a stable connection, which allows for uninterrupted operation over WAN or slow links. For offsite migration, you need to deploy at least one local backup proxy in each site: a source backup proxy in the production site, and a target backup proxy in the remote target site.